The Sharon Recreation Department is looking for a few good Sunfish. Their current mixed fleet is in disrepair and is not conducive with their mission to get as many kids on the water as possible. They have decided to standardize on a single class of boat, so that they can maximize their teaching time, and allow the kids in the program to spend their time on the water in a simple boat, without having to learn the intricacies of several different boat classes. They have selected the Sunfish to be their sole class. Sunfish are the most popular sailboat in the world, with over 200,000 built. Used Sunfish are generally available for less than $1,000, and frequently people are willing to donate their older unused boats to a program. 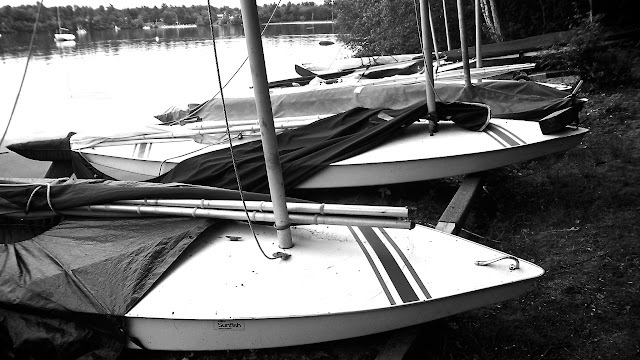 Gary Werden has volunteered to refurbish any boats acquired by the department, and the Massapoag Yacht Club is lending a hand in soliciting donations, and will welcome the young sailors into their regular Sunfish racing program. So, if you have any old Sunfish lying around, and want to give it a good home where it will be used by happy kids, please consider donating your Sunfish to the Rec Department.